A drug-user was caught behind the wheel of a car after police spotted his vehicle swerving in the road. 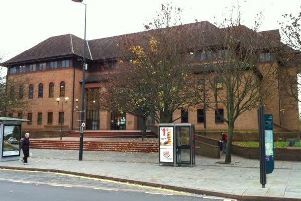 Chesterfield magistrates’ court heard on Tuesday, August 16, how Mulonda Mubonda, 23, of Somerset Drive, Chesterfield, was driving a vehicle along Hasland Road, Chesterfield, when he was seen veering across the centre line in the road. Prosecuting solicitor Robert Carr said: “This offence came to light about 12.30am, just after midnight, as police were driving along Hasland Road behind the defendant and they saw the vehicle veering left and right and crossing the centre line. Tesco employee Mubonda registered 17microgrammes of cannabis in his blood which exceeded a specified legal limit after the incident on May 23. He told the court that he accepted the prosecution’s account of the incident and he explained that he had been making his way home when he was stopped by police. Mubonda, who has no previous convictions, pleaded guilty to driving a vehicle while having a controlled drug in his blood which exceeded the specified legal limit. Magistrates fined Mubonda £207 and ordered him to pay £85 costs and a £30 victim surcharge. Mubonda was also disqualified from driving for 16 months. The chairman of the magistrates’ bench, Martin Thacker, told Mubonda that during sentencing they had taken into account the high amount of drugs and the potential for an accident.